Getting hacked by someone is certainly not great shakes but you can try these quick tips and tricks to regain the access to your Hotmail account before it is too late. Before you get started with the recovery process, you must make sure that your Hotmail account is really been hacked by someone. You must check the recent activity page. Check both, the successful and the unsuccessful login attempts. Click on the “Secure Account” right away when you are in doubt. 1. Reset the account password: The moment you realize that someone has already sneaked into it then you must immediately change the password. If you are unable to sign-in it means that someone has already changed the password. Then log on to Hotmail sign-in page and Press the button “Forgot my password” followed by “I think someone else is using my account” and follow the on-screen information to reset the password. 2. 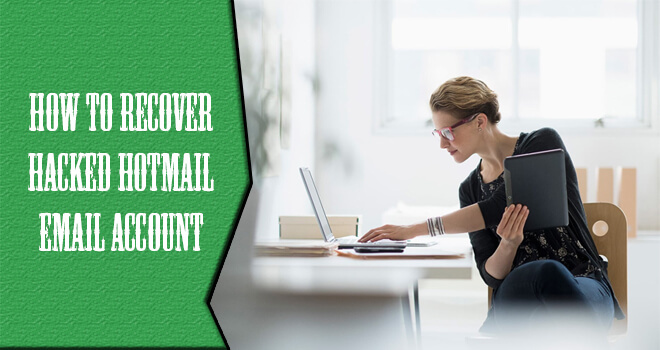 Recover the Hotmail Account: You must keep in minds the points mentioned below before you actually go ahead and initiate the recovery process. Remember, the recovery process is the last option to regain the access to your Hotmail account. Basically, Recovery process gives you the last chance to verify the ownership of your Hacked Hotmail account. If in the case, you have enabled the Two-Step Verification earlier then, it would be impossible to regain the access via recovery form. Recovery form will ask you a couple of questions to make sure that you are the only owner of that specific account. You need to answer as much as you can and Microsoft will review the answers submitted by you. Someone from the support team will get back to you via email. The user must use the same computer which you used to sign-in frequently. If you don’t know the exact answer to any of the question then you must leave it blank. You must provide your alternate email address so that someone from the support team can get back to you later on. Click “I think someone else is using my account” choose the reason then Press Next. Provide the email address, phone number or the Skype ID. Choose “I don’t have any of these” and press the Next button. If you have the account recovery code then provide it here otherwise, click on the No button. Now, you must be on the recovery page. Fill the recovery form and provide the information. Press the “Submit” button once finished. Now, you will have to wait for 24 business hours for the recovery results. You will be given to regain the access to your Hotmail account if the recovery request is accepted. Attentively, you can also have a word with our certified Hotmail Customer Service technicians for the quick support and prompt resolution. I need to recover my Hotmail account , I have important and sentimental files store. I try last year since October and I think I use different password my self and end blocked.